This post about gluten free snacks has been sponsored. I received samples at no charge for inclusion in this post but all opinions expressed here are my own. A few weeks ago I decided to try a gluten free diet to see if could help with a few random health issues. For the first few days of my new gluten free diet I wandered around in a state of hunger and agitation, with a distinct desire to gnaw off my own arm if I didn’t get something filling to eat immediately. I am a snacker and I have come to realize that every single one of my favorite snacks is high in gluten. Even healthy snacks like granola bars, crackers and cheese or a slice of peanut butter toast are now off limits. I found myself standing in front of the pantry drooling over the bag of Glodfish crackers. After a few days of this near constant hunger I decided I better start stocking up on some gluten free snacks if there was any chance of my children surviving another week. Hunger makes me cranky! So, in an effort to fill my belly and improve my mood I went on the hunt for some gluten free snacks. Here are a few suggestions if you find yourself craving a snack but needing to avoid gluten. 1. Fruit. While you may think fruit sound boring it is actually quite tasty. Dip apples in nut butters or sprinkle with cinnamon and sugar. If you really want a decadent dessert, make up some homemade whipped cream to dip it in. Maybe not as healthy as plain fruit but WAY tastier! 2. Nuts: I have found a great selection of nuts, some salty and some sweet, at my local grocery store. They are high in protein which helps keep blood sugar stable and high in fiber to keep you full. 3. Trail mix: You can make your own with a collection of gluten free cereals (Chex), nuts, dried fruit and chocolate or you can buy it premade. SunRidge Farms has a nice selection and many of their options are organic. 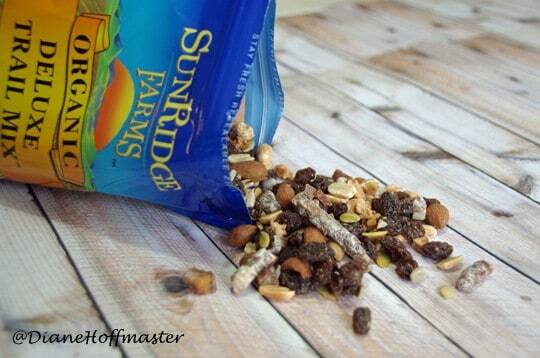 Nuts, seeds, dried fruit and sweet additions of chocolate make a great gluten free snack. 4. Popcorn: Now, popcorn isn’t really filling but it is a relatively healthy snack and if you buy the loose kernels and pop in a hot air popcorn popper you don’t have to worry about what else is in it. You can add your own not so healthy flavors if you want. Melt real butter, sprinkle with Parmesan cheese and dust with garlic salt. Makes a great gluten free snack during movie night while everyone else is eating things you are no longer allowed to eat. 5. 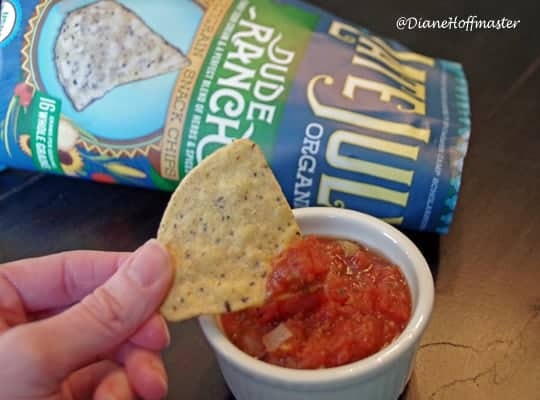 Chips: Just because you need to choose a gluten free snack doesn’t mean you can’t have chips and dip. You just need to be careful which type you are buying. Late July has a great selection of organic, GMO free chips, including several flavored varieties. You can pair them with salsa or guacamole or even make your own homemade dips so you know exactly what is in them. 6. Gluten free pretzels: You may have to look for these in a health food store or the natural foods section of your local grocery store. Most pretzels are not gluten free but there are a few that are made with gluten free grains they just aren’t always easy to find. Of course, you can find gluten free pretzels on Amazon if you are really in a pinch. 7. Granola/Protein bars: Food in bar form comes in very handy when traveling or just running around doing errands on a busy day. Look for bars that are fruit/nut based rather than grain based. Finding one that is high in protein will help keep you full longer. 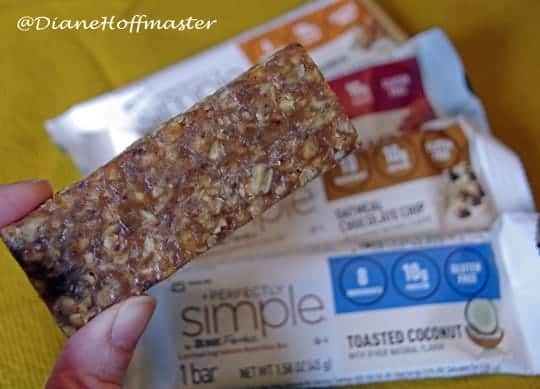 Zone Perfect Perfectly Simple protein bars have 10 grams of protein and a limited ingredient list. There are several flavors to choose from and they make a great gluten free snack to toss in your purse. 8. Home baked goodies: Baking snacks like cookies, granola bars, or muffins at home makes going gluten free much easier. Get a gluten free cookbook and start whipping up something tasty in your own kitchen. My trail mix cups make a healthy and portable gluten free snack, just make sure you look for gluten free oats instead of traditional oats. 9. Yogurt: I find that the full fat yogurts tend to make me think ‘dessert’ and I am always happy to enjoy one after dinner. They also make a nice, filling snack and you can top with gluten free granola or some fresh fruit. You may have to head to the brand’s website to see if they are totally gluten free if there is no GF notation on the package. 10. Cheese and crackers: Yes, there are gluten free crackers out there. No, I have yet to find one that just makes me want to devour them. I have found ones that are okay…and I have found some that taste like bird seed. You will have to try several brands to find one that you prefer. If you have a brand that you just think is delicious please feel free to leave a comment. Right now I am eating the ones that taste like bird seed and I am pretty sure even the birds won’t enjoy them. What sort of gluten free snacks YOU enjoy! What a great article thanks for all the information about all the gluten free snacks out there. I love popcorn, it is my favorite snack, and it being gluten free is a bonus. Delicious, we are not gluten free but I often find myself eating tasty organic snacks that are also gluten free. 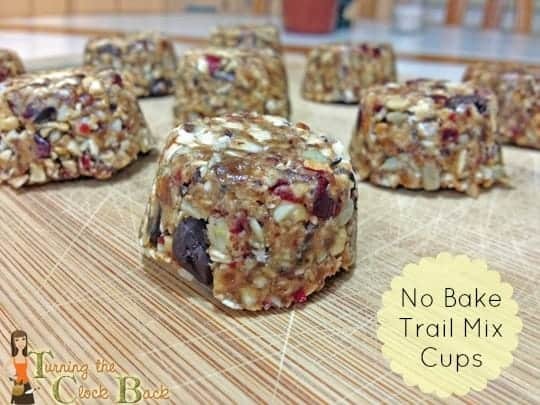 Those no bake trail mix cups look perfect for hiking!! Great suggestions! Popcorn is my snack addiction! The trail mix cups looks awesome. I need to give those a try for breakfast on the run. Love these ideas. It's tough to find GF snacks my daughter enjoys.